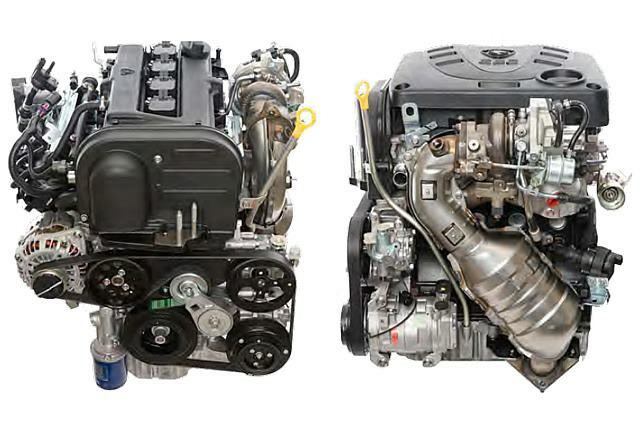 Although based on the existing engine family, retaining many of the key features like bore size, block height, cam positions etc, the vast majority of the components were replaced or modified in some way. One fundamental change was a reduction in stroke from 88 mm to 86 mm. With the retained 76 mm bore, the swept volume reduced from 1,597 cc to 1,561 cc. This was brought about by the very compact height of the existing iron cylinder block which did not provide enough space to increase the required piston strength or lower the piston crown to achieve the desired compression ratio. The compression ratio was set at 8.9:1, which although relatively low for a modern downsized engine, allows the same hardware to be used for all the target markets including those with 88 RON fuel and very hot climates without excessive retardation. The cylinder block was based on the original Campro cast iron block. Extensive finite element analysis (FEA) showed no requirement to strengthen the casting to withstand the increased cylinder pressures. Small changes to the block were made to incorporate piston cooling jets into the oil gallery, and computational fluid dynamics (CFD) driven flow improvements into the water jacket to improve the engine cooling required for the performance increase. A forged steel crankshaft replaced the original cast iron unit in the engine. FEA indicated that it would be possible to maintain the existing main bearing and rod bearing dimensions; however it was necessary to improve the bearing material to withstand the projected loadings. A new piston design with a 19 mm floating piston pin to withstand the higher cylinder pressures was implemented. The cast piston incorporated an anodised top ring groove to prevent micro-welding damage with the expected high temperatures, and a scuff resistant coating applied to the piston skirts. The changes to the piston and the increased gas pressure loading necessitated a change in connecting rod and connecting rod length. A new forged steel fracture cap design replaced the original powder metal design. The aluminium 4 valve per cylinder DOHC Campro cylinder head was re-engineered to accept an intake cam phaser for the CFE application. This was achieved maintaining the existing cambelt location and now permits 40 crank degrees of intake cam phasing for improved performance, fuel economy and emissions. An improved cambelt material was implemented along with an auto-tensioner for improved serviceability. During the cylinder head redesign, the spark plug was changed to a narrow thread, long reach design so that the spark plug boss would allow better cooling as well as a lower coolant back pressure in the cylinder head water jacket. In the same way as the cylinder block, the water jacket design actions were led by extensive up-front CFD analysis. Through the reductions in coolant restriction developed through CFD, only a modest increase in water pump flow rate was required. A new multiple layers steel (MLS) cylinder head gasket was developed to withstand the higher cylinder pressures. To withstand the expected higher exhaust gas temperatures, sodium filled exhaust valves maintaining the original 5 mm stem diameter were selected. An upgraded oil pump was also implemented to compensate for the higher demand of piston cooling jets, turbocharger bearing oil supply, and to maintain good oil pressure at low engine speed so that the intake variable valve timing (VVT) system could be operated. A water-cooled oil cooler is fitted as standard. A Borg Warner turbocharger’s compressor and turbine were selected for maximum low speed performance. It uses a pressure regulated wastegate to control plenum pressure, and incorporated an electric integrated compressor bypass. Air from the compressor is ducted to an air to air charge cooler mounted in the front left hand side bumper aperture. An electrical pump which is actuated on key-off to provide coolant to the turbocharger bearing housing after engine shutdown. This pump also circulates coolant around the rest of the coolant circuit to prevent boiling, an important feature in the high ambient temperature of Malaysia and Proton’s export markets. In line with the original Campro philosophy, the CFE engine uses a single close-coupled catalyst as sole exhaust gas after-treatment as a cost effective fast light off package. Variations in platinum group metals (PGM) loading and substrate density will cover Euro III to Euro V emissions markets. The existing two-mode variable length plastic manifold was replaced with a compact fixed length plastic manifold for the CFE. The fuel rail was re-engineered to a return-less design to reduce fuel heating effects, and higher flow fuel injectors fitted to satisfy the increased performance level. As well as improvements to produce and withstand the increased performance, several other changes were made to reduce the friction of the base engine. These changes included replacing the original engine’s direct acting hydraulic tappets with lower friction mechanical graded tappets that are machine selected on the engine assembly line. Piston ring heights were reduced allowing lower tangential loads and the piston skirts now include a low friction coating. A windage tray was also added to the oil pan that has been shown to reduce parasitic losses by up to 1.5 kW. A higher specification lower viscosity mineral oil was specified to allow extended service intervals along with reduced friction. The main focus for the CFE engine was as a downsized engine to power a large MPV, instead of a potential 2.0–2.2 litre NA engine. It was specified to deliver better full load performance and part load fuel economy than a 2.0 litre NA. 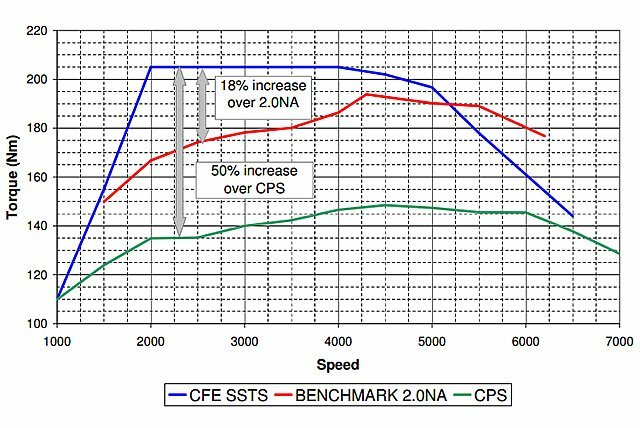 The resulting torque curve, peaks at 205 Nm from 2,000-4,000 rpm to stay within the limits of the CVT transmission, this is achieved with a boost pressure of between 0.6 and 0.8 bar. Sufficient boost is achieved by 1500 rpm to exceed the torque of a 2.0 litre NA engine and to produce more than the peak torque of the Campro 1.6 CPS engine currently used in the Exora. 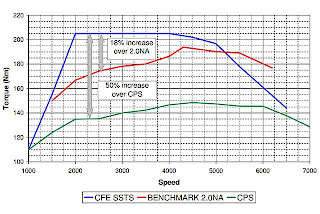 The engine achieved a part load BSFC over 4% better than the state of the art 2.0-litre NA engine benchmarked at the start of the project.